Vagaries' Sunday Weekly Forecast for the week 12th March to 18th March. M-2 moves away, and back to back M-3 follows. The W.D enters the sub-continent from Pakistan on Sunday, 11th March. Precipitating rains in the Northern plains and light rains in upper Sindh, it will move into India on Monday. Monday will be wet in Northern Indian States of Kashmir, H.P. and Utteranchal. Snow would be heavy on the higher ranges and in Gulmarg. On Monday and Tuesday, due to good feeding, we see M-3 sliding into central Nepal. Kathmandu will be getting showers on Tuesday. Monday will see NW winds lashing the Northern plains of India, Gujarat and central India. Tuesday will be warmer in central India with NE winds. By Thursday, the 15th of March, two prominent high presuure systems dominate on either side of the Indian Peninsula, one in the Arabian Sea, and another in the Bay. This will initiate the NW winds over Gujarat and Western India with greater gusts. It will be very windy (SW) along the Orissa and W.Bengal coast. Kolkata will be windy on Thursday. Westerly winds will sweep the Sindh coastline on Thursday and Friday. A bit of fluctuations expected in temperatures next week. Monday: Variable winds in the day, becoming NW by early evening. Day will be 32c and Morning on Monday wil be 15c. Tuesday/Wednesday : Winds divert to the NE direction, raising the day temperatures. Days will rise to 35/36c while nights ( Tuesday morning) will be 19/20c. Thursday: With NW winds returning, Mumbai may see a fall in day temperature from 35c to 31c, and night may drop to 17/18c again. 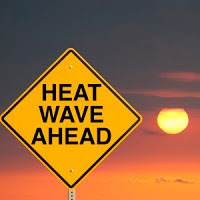 Pune: Monday/Tuesday: Day and night temperatures rising to 36c levels, and nights also going up to 16c. Wed/Thursday: Some respite from the high temperatures as day could fall marginally to 33c, but nights could drop to 13c. Delhi: Monday/Tuesday: After rising on Sunday, the day temperatures could fall marginally again . Monday will be partly cloudy, with drizzles from M-3. Nights will go up to 16c . Windy with N winds dominating.Fall in nights from Wednesday. Bangalore: A UAC forms, around S.I. Karnataka by Tuesday. Cloudy weather on Tuesday with light rains on Wednesday. Chennai: As a weak easterly wave moves westwards, it is strenghtened by a UAC which will form over S.I. Karnataka. Inflow of moisture and clouds will bring rains on Monday to South T.N. and Chennai. Upto 5-10 mms could be expected in the city. The rain spell will last for a couple of days. The rain bearing easterlies will change course as the high forms over the Bay from Wednesday. Winds will turn SE from Thursday. Early in the week, low temperatures will be around 25c, but revert back to 23c after Wednesday. Bharuch: Warming up on Mon/Tuesday, but easing on Wed and Thursday when it will be cooler by 2/3c again .Very windy on Friday. Kathmandu: Showers for Kathmandu on Monday night and Tuesday. Around 5-10 mms possible. Lower day temperature possible ( from the current 27c) as it gets cloudy from Monday. Nights will be around 8c.A slight fall in nights after Wednesday. Karachi: Monday will be partly cloudy and cool with N winds dominating most of the time . Temperatures will be 29 - 13c. Tuesday onwards, west winds will be strong, and would be gusty along the Sindh coastline. Would keep temperatures below the normal. Sukkar: M-3 could bring some rain on Monday, and the day will be cooler at 26c. After M-3 moves away on Monday, the temperatures would remain below normal till Wednesday. Around 30c and 13c would be expected. Rising trends after Wednesday. Interior Sindh and Balochistan regions are now much in a comfortable range, as the days would normally go up to 35/36c by 11th March. But still hovering around 32c, is good. These interior temperatures could reach 37c by the week end. Geomagnetic Storming expected today,Major one expected on 12th..very interesting write by Akshay for those interested in this forthcoming event. See his blog here. at 1430 hrs ,,,,,,the IMD shows agumbe as 31.4 wid 41% rhumidity nd experiencing snow!!! Wat an error !! !snow at 31.4 c lolsss!!!!! RK: Thanks for the report. Confirms ! M-3 effect as mentioned in weekly forecast. Junaid: Let us assume the IMD report Could be an unintentional error.